Ingenious is a new puzzle game based on the best-selling, award-winning board game by master creator Reiner Knizia. Easy to play, but very difficult to master, Ingenious is a unique combination of strategy and luck! 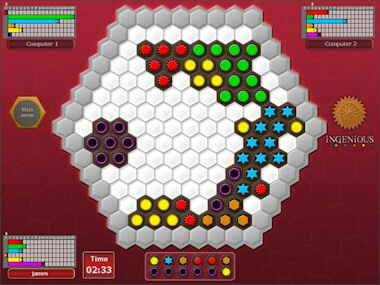 Conquer the board through the careful placement of rows of colors. With every move, you create new possibilities. The more colored pieces are placed next to each other, the more points you can gain. It's a puzzle treat that the whole family can enjoy! A Combination Of Strategy And Luck!